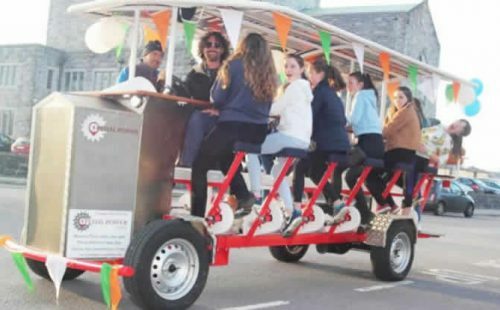 Pedal Power is Galway’s newest form of transportation, with have two pedal powered bikes: “Big Berta” (15 seats) & “The Bug Bike” (6 seats). 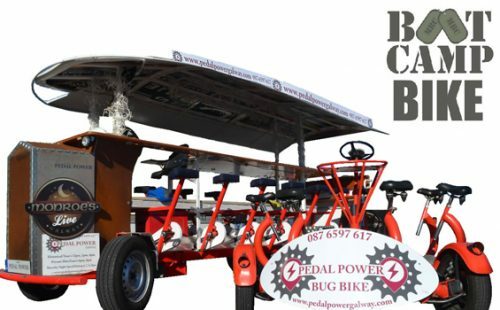 These novel bikes are available for tourists, hen & stag parties, large groups, birthday parties, team building exercises or for any other special occasion choose Pedal Power! 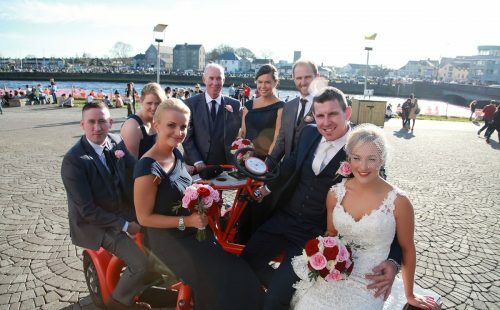 We can cater for groups of 21 at a time. We can create a tour around your needs, birthday parties, retirements, somebody leaving work? We have great bluetooth speakers so you can play your favorite music whilst cycling around beautiful Galway city or Salthill. We did this as part of a hen weekend. It was so much fun and the laughing never stopped. 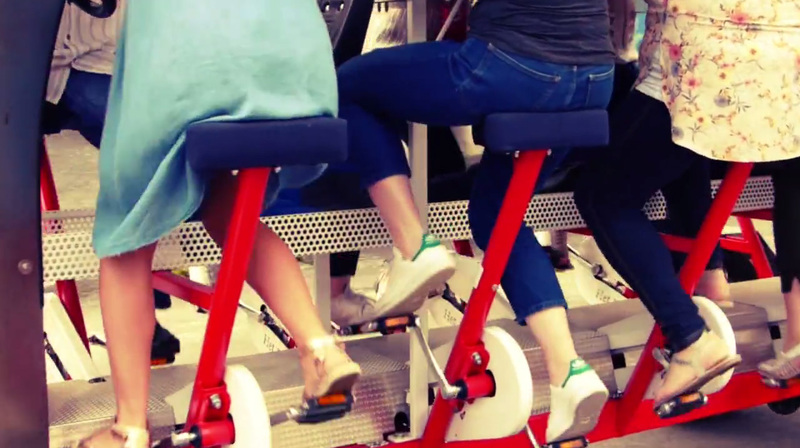 It’s suitable for everyone and there are seats that you don’t pedal in for those that aren’t able but they can still join in the fun. Would highly recommend. I recently took up a new position. My lovely colleagues threw me a farewell party with style. They know I love a exercise, singing and good times so they organised a surprise for me. 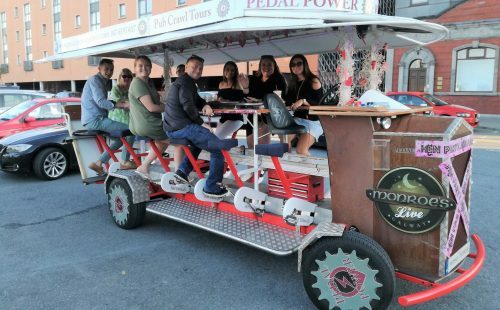 I was already laughing as we approached the open-air pedal tour bus – first stop Dock No. 1, followed by Barr an Chaladh and Monroe’s. 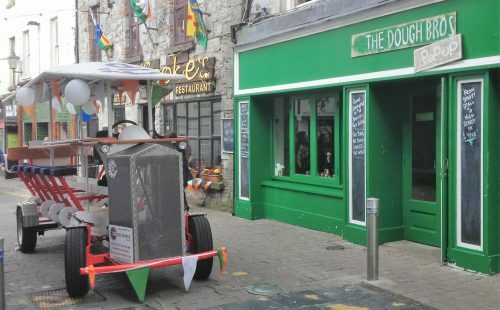 I would definitely recommend it to groups who want to explore Galway in a very unique way all the while singing and having a great time. 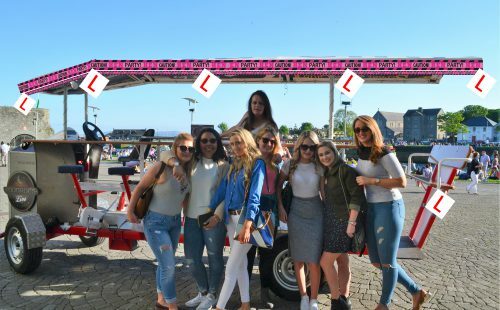 I was surprised by my friends with this activity for my hen party a few months ago, and I can’t recommend it enough!! Brilliant craic and a workout with cocktails, what more could you want?! 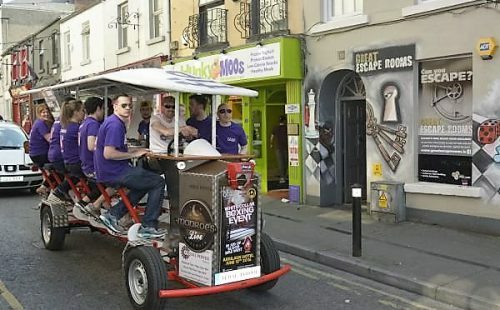 The perfect way to see & learn about Galway while having a good time! Paul was so accommodating, fun & friendly as he guided us though the city on our pub crawl. Loved that you had the ability to play your own music & really customize your ride – so fun! Great experience we did this for my best friends hen and I will deffo be back with family and friends again, it was the highlight of the entire weekend and paul (the man spinning us) was the best crack and great eye candy also would highly recommend for a hen so much laughing was done x thanks pedal power. 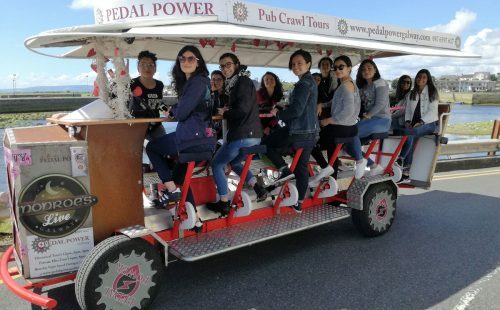 A group of colleagues went on a teambuilding trip to Galway and I had booked PedalPower as a surprise. Everyone loved it and it was great fun. It’s a good way to see Galway and we stopped off in a couple of pubs along the way too. Paul was very nice to deal with and had speakers & music too so that we could have some craic during our bike ride! We had a superb time on pedal power. It was very easy to organise through Paul. It was a very fun experience to pedal your heart out with music blaring to a great reception from locals. The pubs were excellent with live music in many. I can definitely recommend for stag groups.g. Copyright © Pedal Power 2018. All Right Reserved.